Delivering a message in front of the National Association of Convenience Stores! Thanks to everyone who showed up May 5th, 2018, for the NOVA Trash Action Work Force Trash Day of Action! We had a great time! We were a small group, but we made a big splash! Today's Trash Day of Action produced another really enjoyable day. We laugh a lot more on TAWF protests than on any other protests! The "March to the Potomac" went well. We got a lot of people's attention, and handed out all our 200 flyers. Our turnout wasn't overwhelming but TAWF's grizzled core marched on, and we did welcome some new faces, including Ken, from 350 Fairfax, and 3 generations of a family! We started at the International Bottled Water Association headquarters, passed out flyers at King Street Metro, stopped for a group shot at the headquarters of the National Association of Convenience Stores, and then marched down King street. Our signs and costumes caught people's attention and interest, and we had a few people who were especially effective at handing out flyers, like Wendy and Ken. Our mad flautist got caught up in a duel by City Hall, we stopped for coffee at Misha's, and got lots of supportive nods and waves and statements of support from passersby. But it wasn't all sunshine and rainbows, some out there aren't yet ready to hear our message of environmental responsibility, and cling desperately to their single-use plastics. The work continues! Please share and tweet the pictures using #trashdayofaction! Anything you can do to help us get out the message of responsibility is much appreciated! Who needs to hear that message? Retailers and restaurants, who supply their customers with plastic items that immediately become waste. Get ready now for the next Trash Day of Action in the fall of 2018! Thanks to all who showed up and marched with us! 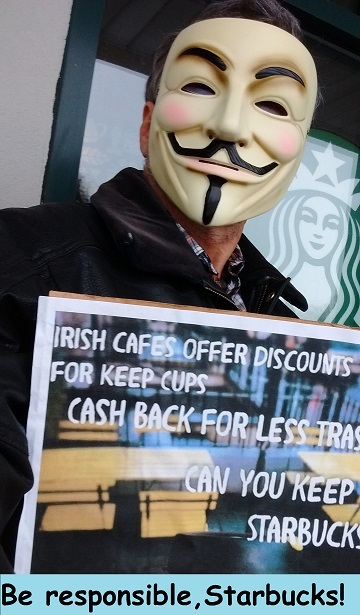 Before the Trash Day of Action, we joined the #StarbucksTrash #SavetheMermaids protest to remind Starbucks they should keep the promise they made years ago to develop a fully recyclable paper cup. The hopeless paper/plastic hybrid they now use contributes to the mounting piles of rubbish around the world. This action was timed to occur the day before the Starbucks board of directors annual meeting. READ ABOUT PAST TRASH DAYS OF ACTION HERE!